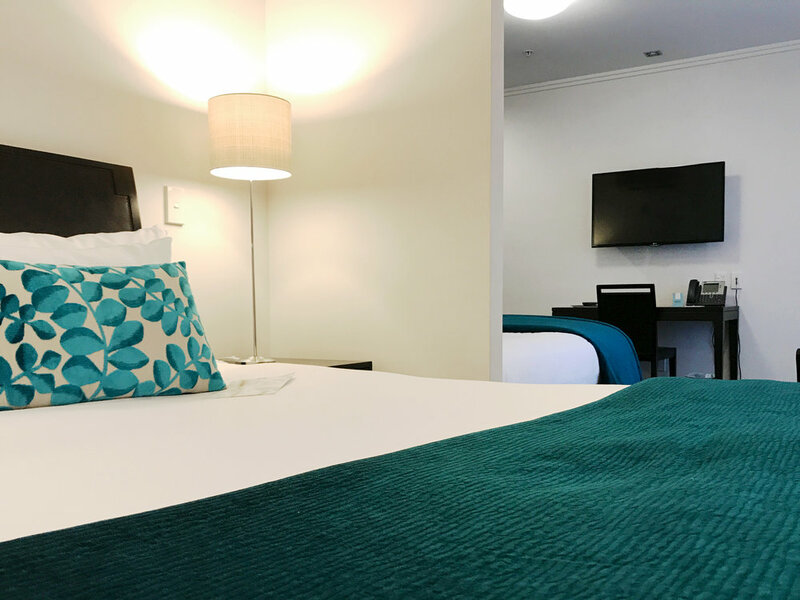 Designed to meet the needs of family accommodation or couples travelling together, the Harbour Deluxe Two King Suite provides a cost effective Tauranga hotel accommodation option. Both Harbour Deluxe Two King Suites offer two (2) king beds with a shared bathroom featuring a spa bath and separate shower. In each hotel room, one of the king beds can be split to form two single beds. Overlooking the hotel pool both rooms have a semi-sheltered balcony with outdoor chairs and views of the inner Tauranga Harbour. Trinity Wharf Tauranga only has two hotel rooms in this category, so you will need to be quick to reserve these popular accommodation options. One of these suites is open-plan, so is more suited for family accommodation or best friends travelling together. * Rates are based on four adults. Maximum 4 guests per room. Accommodation images are indicative only, as views and room layouts do vary throughout the hotel. Hotel Management apply a ‘No-Party Policy’ to all hotel-rooms. Room and balcony areas are strictly non-smoking.